Anyone that knows me, knows full well that I enjoy playing Ultimate Frisbee. Since early 2007 when my brother first got me hooked on the sport I loved it. 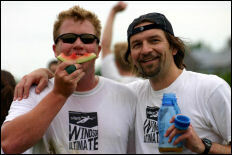 In 2007 I become a board member on the Windsor Ultimate league in Windsor Ontario Canada so my commitement to the sport had increased even more since initially joining the sport. Now after 2 seasons, the biggest problem I find with Ultimate is that it is truly hidden from the mass populus due to the fact that the perceived sport is just something hippies would do on a beach. And that’s just not right. The issue the league faces is that marketing the sport is tough, people just don’t “get” the sport unless they have been introduced to it by a friend. So making posters or print/visual ads is not the best way to get NEW members. The biggest return on our advertising so far is connecting other Ultimate players to the Windsor league. It is difficult and slow coming in getting fresh blood. My best example is trying to canvas my soccer league for recruits for our season in 2008. The most common reply I got was a laugh and some reference that soccer in no way compared to Ultimate. Its almost as if the person just didn’t want to believe that a sport that invloves tossing a disc around could be fun, or competitive like soccer. Funny tho when after one soccer game we played a mock game of Ultimate, the same people that were hating on the sport (prior to playing) where the ones singing its praises afterwords. 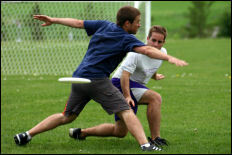 Have any of you played / enjoyed Ultimate? If so post your first experience with the sport. Don’t get me wrong, I ran the University of Windsor Rock Climbing Club (UWCC) for over 2+ years when I was in school, so I know first hand about recruiting for other sports. But Ultimate just seems to be more difficult, where as rock climbing carries a certain mysticism I found people want to try more willingly. Anyways if you happen to be in an administrative function of a sports team/league, how do you manage to recruit new blood? Is it just Ultimate that has a unique set of challanges? Or is it difficult all around for all sports? Post your answers. Next: Morgage crisis? or Process crisis?